No vertical video! Not now, not ever! It’s WRONG! It can’t be Italy. Nobody is talking with their hands. Except for the guy making the face, are any of the other guys really doing anything wrong? Is looking at an attractive woman wrong – -especially after she has passed by? Actually, the guy immediately to her right is “talking” with his hand — his left hand. That point is discussed in the story. But when you look again, there’s not all THAT much going on. The guy who’s grabbing himself and the guy in front on the motorbike look like they might be harassing her, and a couple of other guys are smiling, but other than that the gestures and expressions aren’t all that overt. 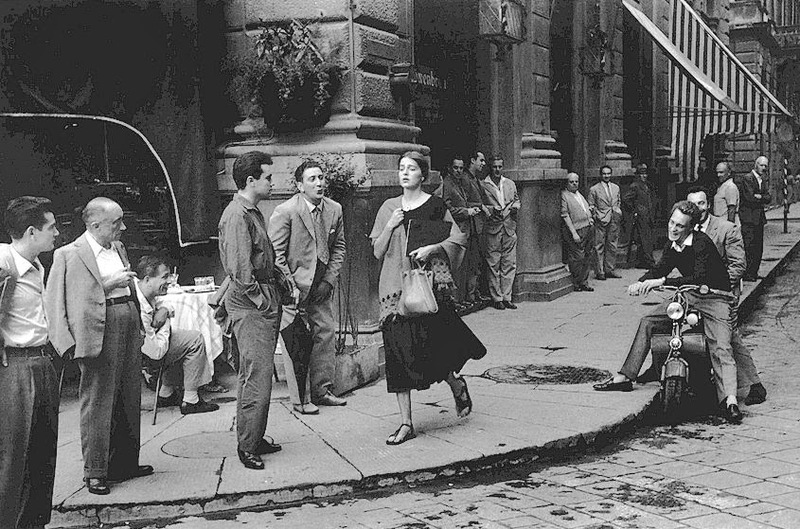 Actually, it now occurs to me that what makes the picture so strong is not that all the men are reacting in extreme ways, but the fact that ALL of them are looking at her. We realize that immediately when we see it, even if it’s only subconsciously. And staged or not, the situation is entirely credible. And THAT’s what makes it such a powerful depiction of relations between the sexes. I’ve always wondered what in the world it must be like to go through life as a beautiful woman such as this one. You’re a human being, just like the rest of us, but you have this power, or curse, or whatever you want to call it, that everywhere you go, about half the people you encounter are powerfully attracted to you. Maybe they’re cool about it; maybe they do their best not to show it, but you still exert a pull on their eyes, one that they either give in to or consciously avoid. Unless you were entirely unconscious of it — and how could you be? — that fact would color every moment of your life that is spent in public. It’s a phenomenon from which Tina Fey used to extract a lot of laughs on “30 Rock,” in terms of the way guys would react to Cerie — or the way Jenna WANTED them to react to her. I love when something like this happens. I first saw this image many, many years ago, and my reaction at that time was something akin to feeling compassion for her, but certainly not sympathy because it didn’t look “wrong”. Then just now, when I saw the image again, the initial feeling was a bit of outrage, but that dissipated pretty quickly, especially after reading about her reaction to it. It’s one of those moments that I can examine and see that my view of some things have changed over the years. And then I read the article you linked, and it turns out the image was virtually staged–the photographer asked her to walk it twice. It sounds like the men knew they were being photographed (Ms. Allen certainly did), so I assume they were mugging it up a bit. All of which really changes the way I see the picture. It’s no longer a spontaneous moment captured by a fortunate photographer, but something more mundane. Still, a great image. It’s art if it moves people, and this one obviously still does. When I looked at it the first time, my initial reaction is that it was staged and thanks to you Norm, you confirmed my first impression was right. It was just too obvious to be an honest reaction by a random group of men on an Italian sidewalk and no other women in sight. If it had been a construction site, maybe, but not at a sidewalk café on a corner.